Shukr is a quality and characteristic that mankind as a whole have yet to master. It is often overlooked in the lives of many and is rarely given its due importance. This lack of having Shukr is recurrent in history and will continue till the end of time, and has brought many nations to their dreaded end. You are probably wondering by now what exactly Shukr is. Shukr is an Arabic term that is often translated as ‘thankfulness’ and ‘gratitude’. Shukr has been defined by scholars of Islam as the mentioning of God’s blessings upon the slave’s tongue, the slave’s recognition of these blessings in his heart, and obedience of the limbs due to these blessings. Therefore, Shukr stems from acknowledgement of God’s blessings upon you, and this is then shown in the form of gratitude and appreciation through actions of the heart, tongue, and body, and sincere worship to God. How Merciful is God Almighty! From this verse, we learn that showing Shukr will increase us in even more blessings, and so even when we thank and praise God for His many blessings, He continues to increase us in them, and this is from the vast bounty of our Lord. Amazingly, Ramadan is connected to Shukr as well. In fact, one of the main purposes for the fasting in Ramadan is so that we may learn to be grateful, and so that we may do Shukr. Looking back into Islamic history, we see the examples and stories of the legends that came before us, our Prophets and pious predecessors, and can derive numerous lessons from their lives – including those of Shukr and Sabr. 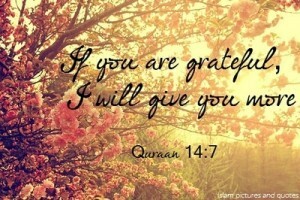 Shukr and Sabr, the Arabic terms for gratitude and perseverance, often come hand in hand with one another. As Muslims, we are advised to show Shukr in times of good and Sabr in times of bad. So, dear brothers and sisters, we must take care to be grateful and exert patience at all times, as we will continuously be put through tests in this world by God, and only through beautiful Shukr and Sabr will we be able to achieve the status of true believers. We ask God Almighty to grant us a beautiful Shukr in this blessed month and the months to follow, to make us from those who show Shukr at all times, and to gift us with a beautiful reward in this world and the Hereafter. Ponder over the blessings that God Almighty has granted you today and thank Him sincerely for them. Our blessings are simply uncountable and immeasurable! Remember that thanking God Almighty for what you have will increase you in sustenance, so remember Him often and thank Him often. Show shukr through your deeds, not just your words! Praise God Almighty with your actions, your tongue, and your limbs. Do not get caught up with this world and its attractions such that you forget God Almighty’s favours upon yourself. Remember that everything is from God Almighty and will return to God Almighty; everything you have and everything you earn is by His favour upon you alone. So beware of self praise and arrogance. I like this beautiful collocation SHUKR and SABR, Ya Allah Grant me.